I have a resolution for you that will be easy to keep. I’ll give you a hint. You can spend a lot of time with it. It shows up about every 4 to 6 weeks. You always preface your actions by saying “better safe than sorry” or “I wasn’t sure, so I want to be safe.” Your friends jump on the bandwagon too. What I am talking about? It’s the Facebook notification you post as your status that tells all of Facebook and your Facebook friends that all photos, status posts, anything you share or anything you comment on is yours forever and ever amen. How plain can I make this next statement? It’s an online hoax. It was an online hoax last month. It was an online hoax six months ago, and it will continue to be an online hoax a year from now. If you all are thinking, “Well, maybe Ryanne, albeit a great intellectual property attorney, is wrong on this one,” let me try and convince you. Your Use of Facebook Is Governed by Facebook’s Term of Use. What this means is that Facebook has a right to use your content and photos. They do not have an exclusive right, meaning you can license out the content to others. However, they do have a limited right to use it without paying you a licensing fee. By use of the word “transferable” that also means they can provide your content to others. What? You mean Facebook does not have to get my permission before passing off my content to others? Yes, technically. But, you will see they have a disclaimer that says “subject to your privacy and application settings.” What this means for you is that anything that is considered “public” with no restrictions is up for grabs by Facebook until you delete it. If you want a bit more protection, then set your profile, photos and content only to people you are actually friends with. “But, Ryanne this isn’t fair. These are MY vacation photos.” You’re right. It isn’t necessarily fair. However, as fun and saturating as it is to our society, Facebook is not a necessity. It isn’t a natural right like voting or freedom of religion. Further, how much have you ever spent using their service? Keep in mind you can limit their ability to share and use your content by privacy settings. Finally, if it truly is precious and you do think you might have the next hit Beyoncé song or John Grisham novel, just don’t post it on Facebook. The above hoax also waxes on about privacy concerns. Here’s the deal – it’s social media. Every time you post just realize that it could be subject to sharing by your friends and friends of their friends. It is the viral nature of it all. Further, if you commit a crime it really isn’t anything for the justice system to get warrants to search your online and computer equipment. Posting a status will do nothing to change that. 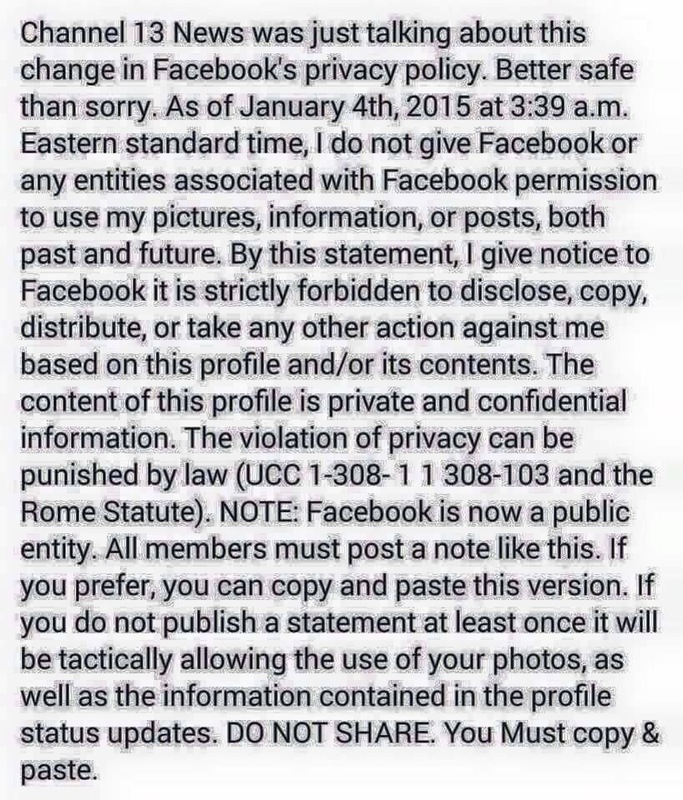 If you would not share it to someone in person or it is really private, then do not post it on Facebook. Some aspects of life are not meant for social media. I’m looking at you Kim Kardashian and those that post “in the moment” birth photos. Trust me, no one wants to see it. Just be in the moment and keep your private moments private or between close friends. I love it when people cite things that seem official. It gives this nerd a good laugh. There is no difference here. The UCC, abbreviation for the Uniform Commercial Code, deals with the sale of goods between merchants. For example, you own a store that sells tiaras and other sparkly merchandise. You agree to purchase items to sale in your store from Sparkly Things-R-Us Wholesale supplier to sell in your store. The terms of the contract outlining purchase price, delivery and warranties would be governed by the UCC. Here, we’re talking about Facebook. Who is the merchant? Where is the sell? In short, the UCC has absolutely nothing to do with privacy or intellectual property rights. My favorite is really The Rome Statute. The Rome Statute is a treaty which established international criminal court and designated certain really awful actions as international crimes, things like genocide. It has nothing to do with privacy or intellectual property rights. International intellectual property rights can be governed by the Berne Convention. The Rome Statute, albeit official sounding, is more applicable to when you procrastinate and your fingers “roam” to Facebook. But, seriously, it does not apply to Facebook. While this blog is subject to copyright protection, help out your friends on social media. Please share, re-blog and re-post this entry. Happy New Year! Take part in the Comments section below and Stay Tuned In! Thanks for the post. You have done a great service to let folks know of these policies. Nice analysis of the limited license we grant FB. I’ve often wondered why we don’t charge FB for its use of our content..haha! So far, I’ve only had 1 FB friend post the resolution. Maybe I need more friends:) Happy New Year Ryanne! Totally love your blog. Thanks!